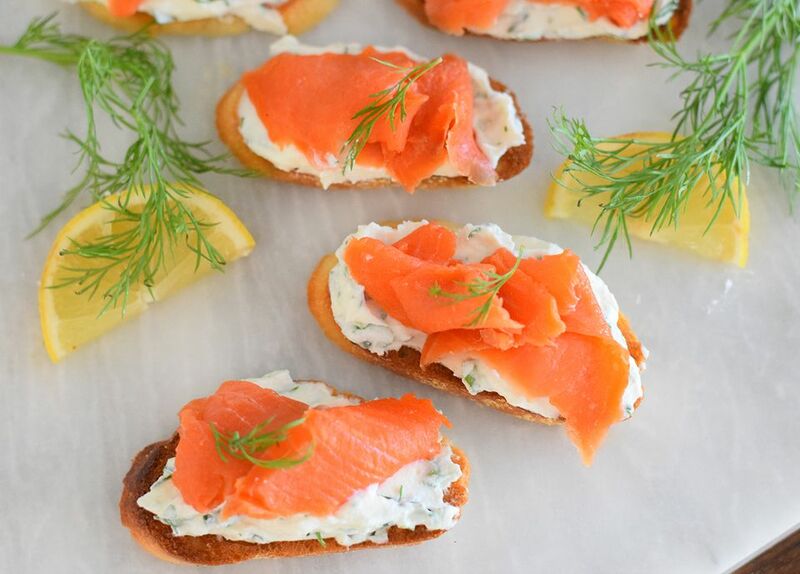 These simple and bright salmon crostini are sure to impress at any breakfast, brunch, or holiday celebration. Fresh herbs, ricotta cheese, lemon juice, and smoked salmon shine beautifully in this dish. Gone are the days of having to make complicated appetizers for an event. Instead, this recipe only takes a few ingredients to make a beautiful appetizer. Fresh herbs are a must for this recipe. Make sure to wash them thoroughly and finely chop them with a sharp knife. Don't chop them too far ahead of time to prevent them from browning. If you can find the fina-style ricotta cheese make sure to use it. It has the best texture and blends nicely with the herbs and smoked salmon. If you can't find that style it will definitely still work very well with regular ricotta cheese. Try to find a fresh or local brand for the best flavor. If you can find wild-caught smoked salmon, that will also provide the best flavor, texture, and color for this dish. Specialty fish shops and grocery stores that specialize in wild-caught and natural fish will have this option in the packaged fish section. You can also buy the smoked salmon at delis that special in bagels and lox. Slice the french baguette on an angle into 1/4-inch slices. Place them on a baking sheet. They can lay close together, but don't have them overlap. Use a pastry brush to brush the olive oil over each baguette slice. If you don't have a pastry brush you can also drizzle the olive oil over the slices. Bake in the oven for 5 to 7 minutes or until lightly browned. Watch them closely to make sure they don't burn. Remove the baguette slices from the oven and allow them to cool on a cooling rack. While they are cooling, whip together the ricotta cheese, chopped herbs, and lemon juice in a medium-sized bowl. Season with salt and pepper to taste. If you are planning on making these crostini ahead of time, then place the ricotta mixture into the refrigerator and place the cooled baguette slices in a plastic bag until you are ready to serve. Slice or separate the smoked salmon into baguette slice sized portions. Place a tablespoon of the ricotta mixture onto each baguette slice. Top with a slice of smoked salmon and garnish with a small sprig of dill. Serve with extra lemon and enjoy immediately!